very pricey. cant even take your own parts to replace. have to buy parts and labour if you want to get your car fixed, at least according to Tim in mechanical department. my car stalled for the first time so I got it towed to them, charged me 52$ in testing, and told me it was the battery, got the battery changed, charged about 250$. in about 20 mins of drive time car died again, the same way it did before. only this time they told me it was the fuel pump and the damage is 700$ after the 10% discount. upon asking if I could procure my own parts from outside I was told I couldnt do that. I felt a little cheated with all the battery thing. Upon talking to them, chuck the owner, adjusted the price and brought it down to 530$ which was nice on their part. I just had my car repaired by Taylor automotive and have nothing but great things to say. First they were quick to book me in and it would have been 3 weeks elsewhere (i checked 3 other icbc approved repairshops). Second, we had an issue with what ended up being a timer of some sort that attaches to the transmission - im no mechanic so forgive my knowledge. Michael took ownership of the whole issue which turned out to also include the transmission which was under warranty from VW. Basically beginning to end and even when it wasnt fully their repair, i was taken care of and never had to worry about anything including the care car. I will go to Taylor motive again should i have to and recommend you do the same! This review comes unsolicited. Today I went to Taylormotive for a wheel alignment. The charge 99.00. When I came back to get my car they told me that my wheels were aligned perfectly. They charged me half for their turn me. It wasnt the $50.00 I saved that had much value, it was the principal in doing the right thing. Well done Taylormotive. This group is excellent! Brought a couple of my cars there over the years, mostly for body work. Work quality was excellent. They were always straightforward, timely, and pleasant. They offer guarantees on their work, and I was recently pleased to see that they do stick by that. Will readily go there again in the future as needed. Its pretty pricey to get your car fixed here as the pricing is somewhat questionable. At least its ICBC certified so you can get your car fixed up without paying a dime if youre not at fault and is around the neighbourhood. Love these guys always super professional and they do the best collision repair of anyone on the area for the price. I could not recommend them enough you know you are getting quality work everytime we go here!! 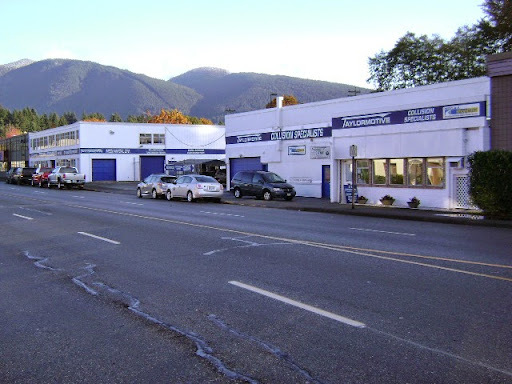 We have been dealing them for over 25 years in both the mechanical side as well as the autobody. They are extremely honest and do outstanding workmanship. Cannot recommend them highly enough. Excellent and fast service. Great experience and highly recommended.